my little red suitcase: A new listing in the shop! A new listing in the shop! My sweet little dog, bless her, she makes me happiest of all. Yes she has her own chair, it's a bit chilly down on the ground you know! and a rather trendy thrifted blanket adds a bit of cosy. Mind you put your fingers in her basket while she's a sleep at your own peril! She can be a bit of a stroppy pants! Blue sky and Autumn leaves, so pretty. I just breathe out when I see this in the sky......I hope to see many of these crisp, clear, sunny autumn days. My mustard cowl I am making. I am enjoying this in the evenings so much, I also have a grey one on the go. I am following this pattern shown by Maaike at crejjtion, on her post here. It's so easy. I had decided this thrifted wool was too thin to be used for anything and it was already in my charity shop bag when I saw that Maiike had also used some thin yarn. I'm using a bigger crochet hook, size 6. Which is nice for a change. I am so going to enjoy wearing this. Have you spotted my felted pumpkin. I made this a while ago. At the time I thought a whole garland of different fruit and veg would be fun, but never got further than the pumpkin! Lastly, this beautiful picture by Elsa Beskow from her book 'Around the year'. I have this open on my table. Her paintings are so sweet. This is October. This book was from my sons childhood and it's keeper. I might show you more of the pictures through the year. 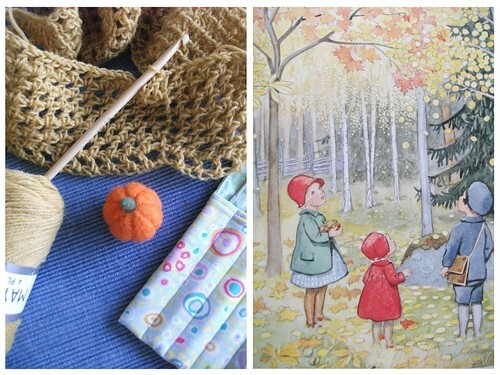 Hope you are enjoying the Autumn days, I wonder what are you making at the moment? 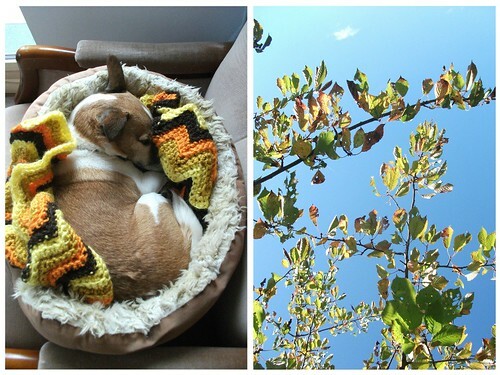 lovely cushion, lovely dog and lovely cowl!!!! Good morning Heather! Your cushion is absolutely adorable! The colours marry perfectly together. I am so pleased you introduced me to the work of Elsa Beskow; just my style. The sun is out this week in France. Has it found its way to your corner of the world? Hi just found your lovely blog. Oh do share more of the lovely illustrations. I am struggling with the journaling on a winter sunrise layout. To be posted later today in flikr. Awww - look at your little dog all curled up. So nice to stumble across your blog. I love your pup and blanket shot, so cute and comfy! I'm doing Jen's project too and as well as reminding me of the good stuff, it's proving to be an ace way to connect with like-minded people. I shall be back! Beautiful cushion, nice are the colours and the white.. Your pooch is too cute all curled up there!! Hi Heather,I just found you from hopping over from Sarah at Squiggling about. I love your blog,Your crochet is amazing! Sorry for the delete, I thought the first try hadn't come through and then it did, two comments from me was quite enough! I'd just popped back as I'd forgotten to ask what your cute little dog is called? Those are the most amazing happy things! Especially puppy with his very own afghan! 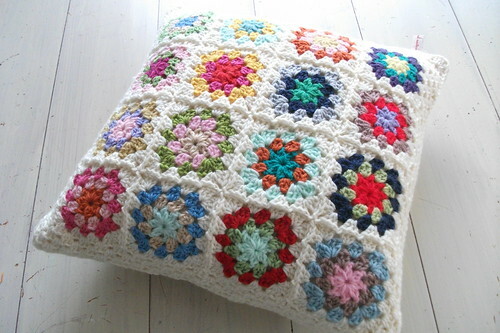 Love the pillow, I've been working on one for a LONG time, seems I cant get it finished though!